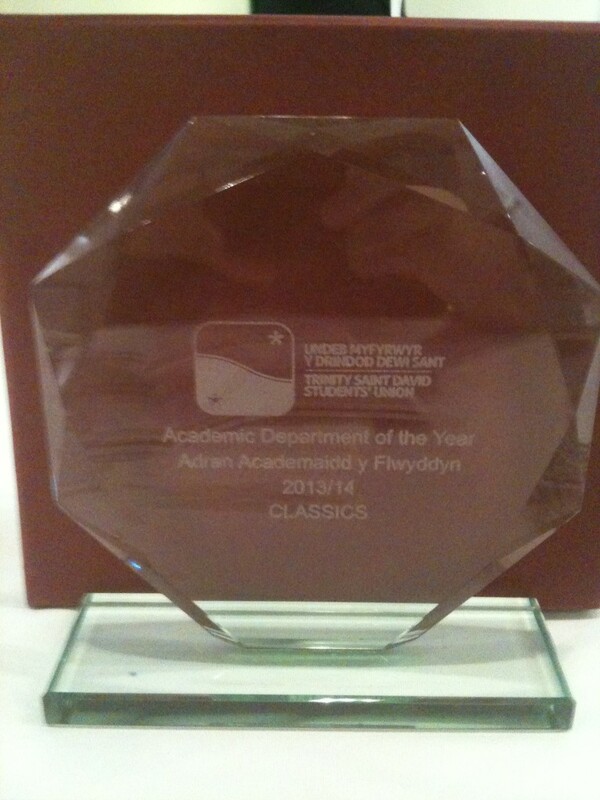 School of Classics Wins Academic Department of the Year Award! We are thrilled to announce that the School of Classics has won the University of Wales Trinity Saint David’s inaugural Student Led Awards’ coveted Academic Department of the Year award! The Awards were founded by the UWTSD Students’ Union, and voted for by the students of UWTSD’s Carmarthen and Lampeter campuses, which makes this award especially meaningful for us. The trophy is currently on display in the office of Head of School Dr Kyle Erickson, and will shortly be moved to the Tony Brothers Memorial Classics Library (formerly the Classics Resource Room). Hopefully it will not be alone for very long, as we aim to defend our title next year! The staff of the School of Classics were not alone in being honoured on this occasion. One of our second year undergraduate students, Georgina Bendall-Crawley, who is reading for BA (Hons) Ancient History and Classical Studies, was presented with the award for the Best Course Representative. As the AHCS Course Rep, Gina represents students at the Staff Student Feedback Committee which meets once a term and makes sure that student concerns are presented to staff (and these concerns can be over anything, not just academic matters) and acted on. Gina has been an excellent course rep this year, and will hopefully continue to be one next year too!